Williams offers a reading of the bestselling but controversial Dominican-American writer Junot Díaz, which identifies in his work some of the unresolved language politics of empire, decolonisation, totalitarianism and migration. The chapter questions perspectives on Díaz which identify in his multilingualism a democratic, universalist impulse, by instead asserting that Díaz’s writing strategies must be read both as a part of his extensive authorly self-fashioning and the antagonistic relationship he cultivates with both readers and institutions. Williams also argues for a closer consideration of Díaz’s relationship with Caribbean history and philosophy. 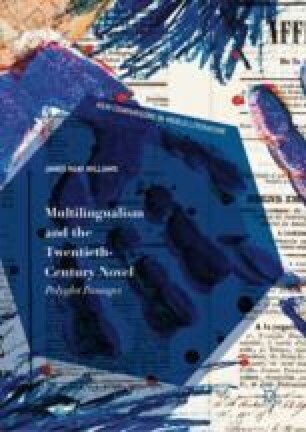 Ultimately, the chapter suggests that Díaz’s foregrounding of risk, antagonism and violence makes for an aesthetic of ‘dangerous multilingualism’. Derby, Lauren. ‘Hispaniola: Trujillo’s Voudou Legacy’. http://therevealer.org/archives/16375. Díaz, Junot. ‘MFA vs POC’. The New Yorker, April 30, 2014. http://www.newyorker.com/books/page-turner/mfa-vs-poc. Kim. ‘The Annotated Oscar Wao: Notes and Translations for The Brief Wondrous Life of Oscar Wao’. http://www.annotated-oscar-wao.com/. Knight, Henry Ace. ‘An Interview with Junot Díaz’. Asymptote, January 2016. https://www.asymptotejournal.com/interview/an-interview-junot-diaz/. Late Night with Seth Meyers. Season 3, Episode 8, October 1, 2015. http://www.nbc.com/late-night-with-seth-meyers/video/junot-diazs-mother-wasnt-impressed-with-his-pulitzerprize/2915308?onid=147636#vc147636=2. Shanahan, Mark, and Stephanie Ebbert. ‘Junot Díaz Case May Be a #MeToo Turning Point’. Boston Globe, June 30, 2018. https://www.bostonglobe.com/metro/2018/06/30/junot-diaz-case-may-metoo-turning-point/3TMFseenE4Go1eVsqbFSxM/story.html. YouTube. ‘Junot Díaz and Karen Russell on Writing Short Stories’. https://www.youtube.com/watch?v=pqb7bcSZcDo.